Bepanthen Nappy Rash ointment has a unique dual action to help treat and prevent nappy rash whilst providing a soothing relief for your baby. Bepanthen® Nappy Rash helps soothe, actively heal and protect your baby's skin from nappy rash. A clinical study1 has shown that using Bepanthen® Nappy Rash to help protect baby's skin at nappy change leads to a lower incidence of nappy rash. Apply a thin layer to a clean, dry baby's bottom at each nappy change to protect against nappy rash and gently aid the natural skin healing if nappy rash is already present. Bepanthen Nappy Rash contains Pro-Vitamin B5 which helps the skin to heal and repair its natural barrier from within. Bepanthen Nappy Rash is specifically formulated for baby's delicate skin. 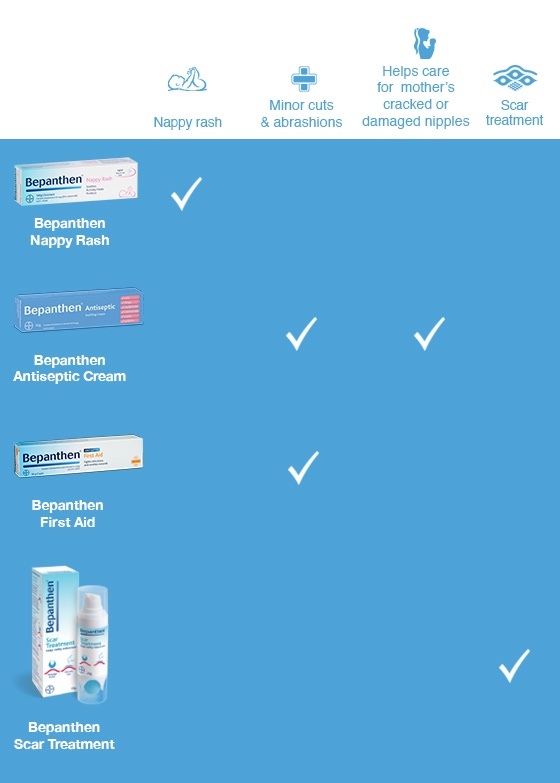 Bepanthen Nappy Rash has a unique dual action to help treat and prevent nappy rash. Bepanthen Nappy Rash ointment helps soothe, actively heal and protect your baby's skin from nappy rash. Bepanthen Nappy Rash ointment has a unique dual action to help treat and prevent nappy rash whilst providing a soothing relief for your baby. Bepanthen Nappy Rash is specifically formulated for baby's delicate skin. Bepanthen Nappy Rash ointment helps protect against nappy rash and keeps the baby’s skin hydrated whilst providing a long lasting breathable waterproof barrier. It also contains Provitamin B5 (dexpanthenol) which acts to repair baby’s skin. If your baby has nappy rash, Bepanthen Nappy Rash's gentle formulation quickly soothes the soreness and aids natural skin healing Free from all colours, fragrances and preservatives, so it’s the gentle choice to help treat and prevent baby’s nappy rash. A clinical study1 has shown that using Bepanthen® Nappy Rash to help protect baby’s skin at every nappy change leads to a lower incidence of nappy rash. - actively heals baby's skin from nappy rash. - helps heal and prevent nappy rash. - free from all colours, fragrances or preservatives and is gentle enough to use at every nappy change, even on sensitive skin. Purified Water, Wool Fat (Anhydrous Lanolin), Liquid Paraffin, Soft White Paraffin, Dexpanthenol (Provitamin B5), Almond Oil, White Beeswax, Cetyl Alcohol, Stearyl Alcohol, Protegin XN. Contains: Dexpanthenol 50mg/g (Provitamin B5). Apply a thin layer at every nappy change to care for or protect against nappy rash and aid natural skin healing.